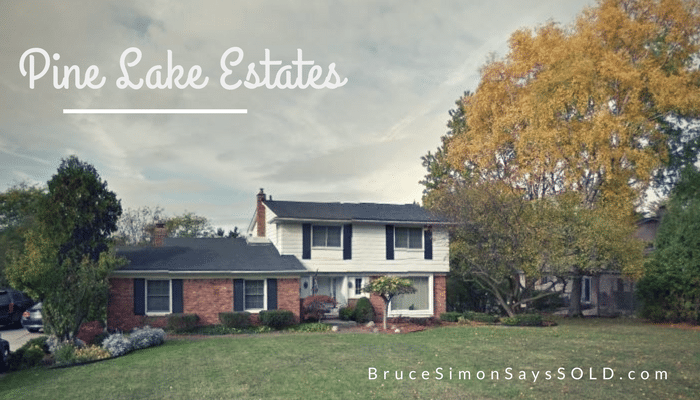 Pine Lake Estates is an enclave of 281 homes in West Bloomfield Michigan. It’s just south of Pine Lake and Orchard Lake, northeast of the heart of West Bloomfield. Most of the homes were built between 1960 and 1969. The community stretches across Long Lake Road with about 30 homes north of the road boarding Pine Lake with a small beach area. Residents have privileges to ‘All Sports Pine Lake’ with access to a private beach with beautiful swimming area, picnic tables, volleyball court and a boat launch. Just minutes away from fabulous restaurants and shops on Orchard Lake Road. The homes range between 1800 – 2900 square feet, 3-5 bedrooms and 2-4 bathrooms. Homeowner’s dues are $255 annually, which covers management and reserve fees. Homes typically feature a fireplace, great room or family room, 2-story floor plan, Colonial architecture, and bedrooms upstairs. Lots are between .30 – .50 of an acre. Most lots have several trees and spacious backyards. Home prices are between $225,000 – $400,000. Many homes have seen numerous upgrades over the years and homes on the lower end of the price range may still need updates. The majority of the homes are owner-occupied but these properties also make excellent investment rentals. Homes in Pine Lake Estates typically rent for $1900 – $2400 per month. Of the 281 homes in Pine Lake Estates, 220 are in the Bloomfield Hills School District and the remainder are in the West Bloomfield School District. The majority of the homes are served by Lone Pine Elementary School, West Hills Middle School, and Bloomfield Hills High School.